Sweden was on the verge of losing a point on last night’s match against Qatar, but a last save from Andreas Palicka gave them the 23-24 victory to secure two points to the main round. What could’ve ended up as a big disappointment for the fans in yellow filling the Royal Arena of Copenhagen last night, turned out to be a celebration for the Swedish. After a rather slow start, neither team could establish a good difference and after 11’ the score was 4-4. Good performances by Daniel Saric and Andreas Palicka made it hard for the teams to score, but after 19 minutes, the Scandinavians took the lead 4-6. Qatar caught up with goals scored by Cuban-born Rafael Capote and Frankis Marzo at 20’. The last ten minutes were a goal-by-goal dispute that saw Qatar having the last word (or goal, rather). Youssef Ali scored and received a tough foul by Linus Arnesson, who saw the red card. The Asian champions went to the locker rooms 11-10 ahead. On the second half, Qatar would have the better start and once again, goals by Capote and Marzo put them ahead 14-11 after 4 minutes. However, Sweden was able to catch up every time. Key saves from Palicka and goals by Mattias Zachrisson (who would be named player of the match) kept Sweden alive in a match that was crucial for both teams, but mostly for the Asians who depended on a victory to keep their main round chances intact. The parity would continue until the very end. With 4 minutes left to be played Sweden had built up a three goal difference, but that wouldn’t be enough to relax. Three consecutive goals by Ali on fast break set the teams apart by one goal only. On the last minute of the match, Saric made a save that gave Qatar the last possession and the possibility to tie the encounter, however, an amazing save by Palicka with 5 seconds left secured the victory for the coached by Kristjan Andreasson. 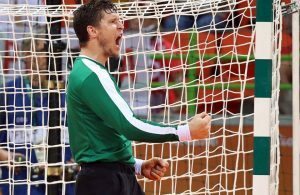 Andreas Nilsson, author of three goals on the match, stressed the importance of being “fresh” for tomorrow’s match against Hungary: “We’re good, we’re rotating a lot in the team all the time, we’re not playing more than 17 minutes per game, so I think we’re pretty fresh until now. It was a tough game today, we had some clear chances to score, but Saric played well. I think today we played OK, but I don’t think we used our full potential, I think we have more to give”. Regarding their ambitions for the rest of the championship, the line player expressed: “We want to go as far as possible, of course. We want to be among the last four and that’s why we have a key game against Hungary tomorrow. We want to go through with four points so that we have a chance to go through to the semifinals, so that’s our main goal”. While Sweden will fight to go to Herning with 4 points that will put them in a good starting point thinking of the semifinals, for the 2015 finalists, the chances of moving to the main round are scarce. A draw between Egypt and Angola would keep Qatar’s chances alive, and of course, they would need a victory against Argentina in order to get their main round ticket. In the event that Egypt draw and Qatar wins, they Asians would have the same number of points (4) and because they beat the Africans, they’d have the lead that would take them to Herning. If Angola wins, then the same would apply, but against them. A victory over Argentina would put them with 4 points, tied with Angola, but because they lost their match against them, the African’s would go through. Next Story → #Handball2019: Eight teams at TOP 12, four more to be decided today!